Sick of the same old, same old? Want to send out a text campaign that really packs a powerful punch? Give this out of the box idea a try. Did you ever read those choose your ending stories when you were a kid? Picture that, but in text message form. Here’s three crucial parts to every text marketing storyboard. Invite subscribers to play the game. 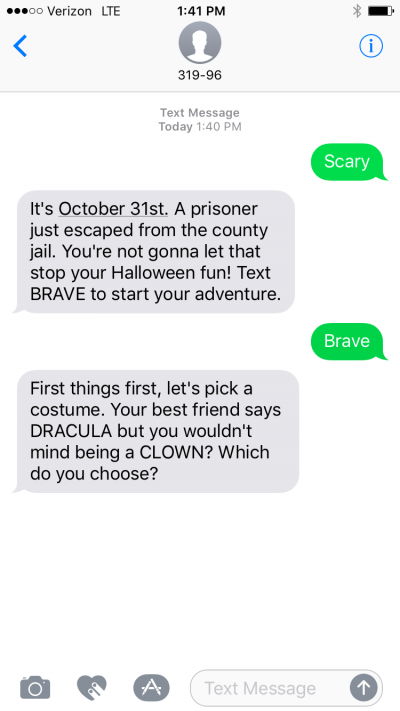 Think of it like a text to win contest. Don’t promote it as a mobile VIP club. Instead, let it be a fun activity for customers who want to engage. People love making choices. It’s a bonus if these choices affect the outcome of the story. For example, what Halloween costume do you choose? Where will you go tonight? The more options, the better. But, just remember, your options must either split off into two different scenarios, or redirect to the same storyline. Let it play out with a few details. Use textwords like “next, read more, read, continue, or go” to continue the tale. Fill in the blanks with some backstory. If subscribers are making choices every text, it will dilute the narrative. Here’s a few best practices to remember. Your use case must be set to one time messages. This will remove the compliance statement from the auto reply. But, knowing this, you cannot text any contacts you acquire via these textwords or this story. If you want to up the ante, offer a prize for those who choose a certain ending. Make sure inboxing is turned off, this is a non negotiable. What does this campaign do for you, the business owner? 1. You build brand loyalty by interacting with customers in a fun and entertaining way. Partner up with a text marketing platform that makes innovation and customer success its number one priority. Want to get more info? Give us a ring at 1.800.688.6290 or shoot us an email, info@slicktext.com. If you’re ready to get started, head over to the pricing page, and pick a plan that best fits your needs. We even offer a free forever plan for those who aren’t quite ready to make the leap. Our feature rich platform makes texting customers a total breeze.